As many of you are aware, Spenser and I will be getting married in New Orleans in September. We (but mostly I, Adrianna) have been in the process of planning this wedding since we arrived in China (and I even secured the venue and the dress before we left the country, talk about being prepared!). It hasn’t all been peaches and cream though; without our wedding coordinator on the ground in NOLA, there’s no way in hell anything would be going smoothly at the moment. But this post isn’t about that celebration, legendary as it will be, but about something we recently did here in China. Spenser and I have made some great friends since we’ve been here. Unfortunately, most of them will be unable to attend our actual wedding in ‘Merica since a good number of them will be returning to Shenzhen come August (for China, Part 2: The China-ing). 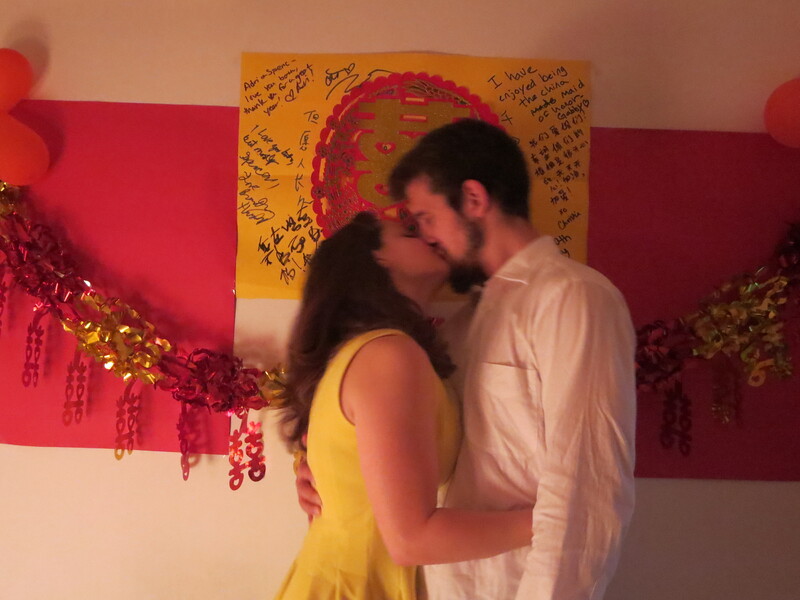 In turn, our friends decided to throw us a Chinese style Wedding Reception for our 5th anniversary. 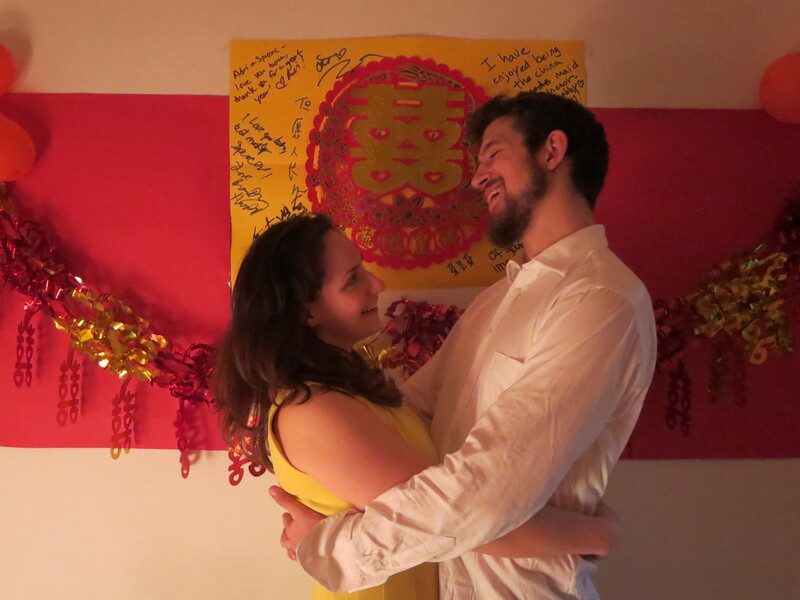 It was initially going to be a huge thing with a ton of people but we decided that, much like our actual wedding, we’d feel more comfortable if we kept things small (and, presumably, more controllable). Just look at those decorations! This party was primarily put together by our awesome lady friends/ China wedding party: my “China Maid of Honor”, Gabby, and my “China Bridesmaids”, Ari and Gina. For the entire week, we were scheming and planning, planning and scheming on how to make this a delightful party. Everyone was supposed to bring food and drinks and what started out as a fancy wine and cheese anniversary party very quickly turned into something else—and it was great. Seriously, these are some wonderful ladies. We started off the evening with a hilarious, lovely, and non-denominational prayer from our dear friend and fellow Okie, Jared. It really set the tone for the evening: overblown, ridiculous, and all-encompassing. After the prayer, I introduced the “House Rules” that Spenser and I came up with before the party. This list included some gems like, “If you wear the panda hat, you must speak in Chinese only. If someone talks to you in Chinese, they must finish their drink and don the panda hat,” and “If someone points at you and says ‘Buffalo’ and you’re drinking with your dominant hand, you must take a drink. However, if your drink is in your non-dominant hand, the ‘buffalo-er’ must take a drink,” etc. 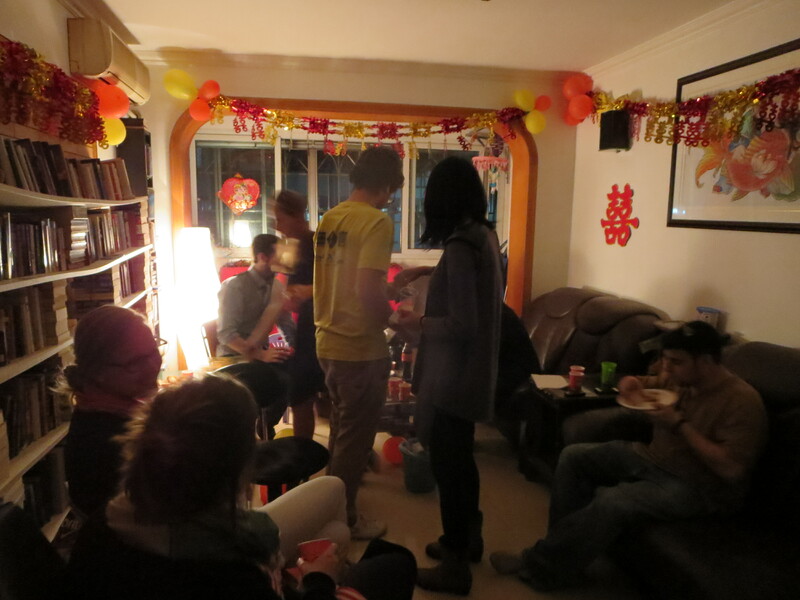 Basically, there were silly hats involved, lots of games, and general shenanigan-ery. Kane, because his Chinese is so good, was wearing the panda hat A LOT. Gabby’s a Disney princess, I swear. To make things even better, the ladies set up a “photo booth” in the spare bedroom complete with banners and markers so guest to leave a nice message for the “bride and groom”. I’m actually surprised that this room survived for the entire night. 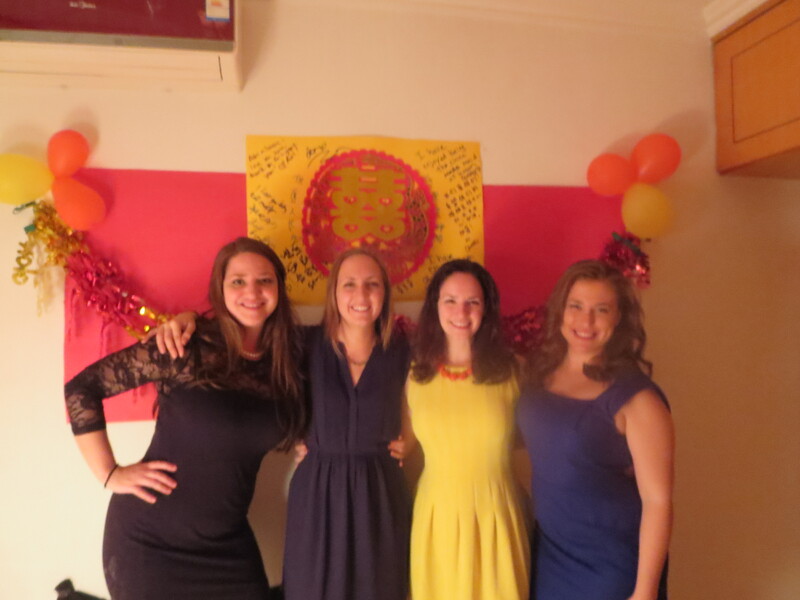 Needless to say, we partied late into the night and had a fantastic time. I wish all of these people could come to our actual wedding, but as far as fake wedding receptions go, this was by far the best one I’ve ever attended. Thanks for everything, guys! …Oh, you want to know what happened the next day? How horrible the mess was, how awful we all felt, all those dirty details? Too bad! There are no dirty details, only pleasant surprises. Kane cleaned up the entire apartment after everyone left (he even mopped the floor! ), Spenser and I felt just fine (can’t say the same for everyone), and we ended up hanging out with Gina and Ari for most of the day. We blew up the rest of the balloons (because why not? ), ordered in pizza, and watched Mars Attacks. 20+ hours of a wonderful time. What great friends you have. Looks like fun and … Iron?